A Bachelor of Education (Elementary) degree requires 151 credits of course work including structured educational placements. These schools and community placements give students an opportunity to assess their potential for teaching and to relate their academic studies meaningfully to their classroom experiences. During the first two years at one of the NITEP field centers, arts/science courses from the local community colleges or universities are taken, as well as education courses from UBC. The education placements are both during and at the end of each academic year. The NITEP year begins in September and for the first three years concludes with the final education placement in May. The remaining years are taken at the main UBC campus in Vancouver, where students complete the remainder of their program. There is a 10-week school practicum and 3-week community field experience in Years 4 to 5. 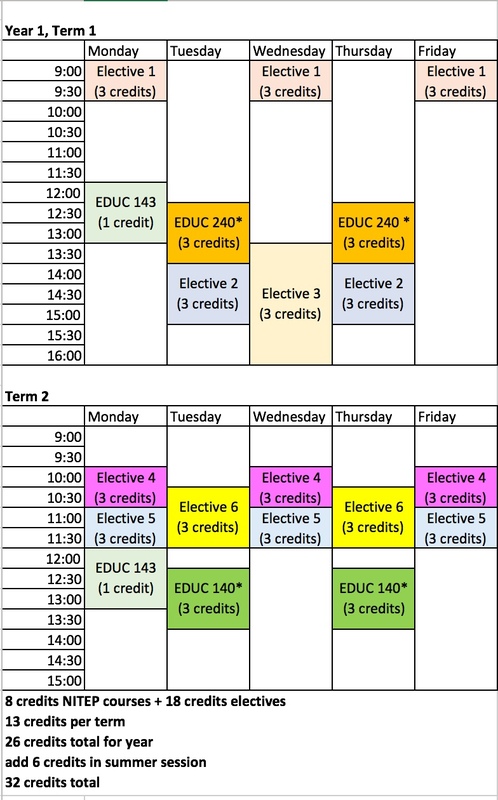 English (6 credits of first year English) and Mathematics (3 credits) must be completed in order to advance to Year 4. Please visit the Teacher Education Office's website here to view the detailed course schedule and course outlines for the Elementary BEd program option. The Secondary BEd program option requires a minimum of 151 credits of coursework. The maximum number of required credits will vary depending on the student’s choice of a major, major/concentration or concentration/concentration. Structured educational placements are also required. These school and community placements give students an opportunity to assess their potential for teaching and to relate their academic studies meaningfully to their classroom experiences. During the first two years at one of the NITEP field centres, arts and/or science courses from the local community colleges or universities are taken, as well as education courses from UBC. The education placements are both during and at the end of each academic year. The NITEP year begins in September and for the first three years concludes with the final education placement in May. The next one to three years are taken at the main UBC campus in Vancouver, where students complete the remainder of their program. In order to be promoted to the Professional Year (Years 4-5), students must complete all academic requirements for the teachable subjects and obtain a 65% average on the required senior courses (300 and 400 levels) for each teaching field. All education placements must be completed. Year 4–5 begins in September and ends the following August. Teacher candidates should consult with their NITEP Coordinator regarding course planning. All courses must be university level. English must be completed in order to advance to Year 4. In order to be promoted to Year 5, teacher candidates must have completed requirements for teachable subjects and have achieved a minimum average of 65% in these subjects. 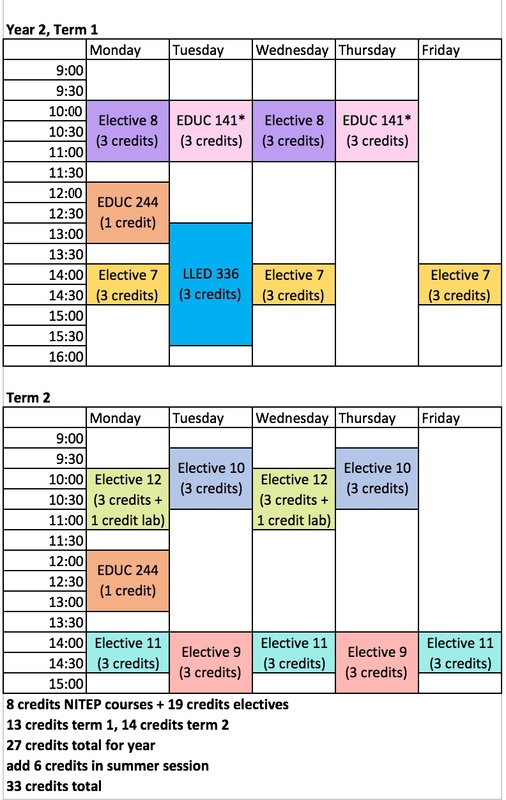 Please visit the Teacher Education Office's website here to view the detailed course schedule and course outlines for the Secondary BEd program option. 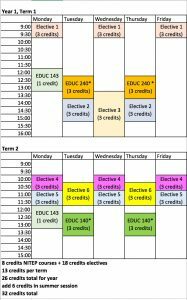 The timetables shown below are a sample of a full courseload including summer courses in order to complete the program within four years. 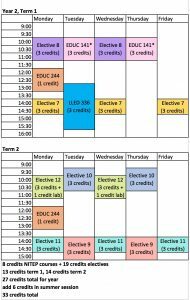 Timetables are flexible and may change depending on the chosen electives and field centre location. 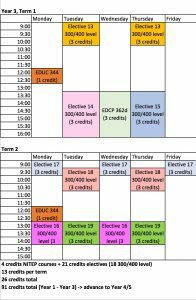 Courses listed with an “*” are delivered online and may not have a scheduled time. Teacher candidates are committed to 11 months of accelerated studies from September to July. There are no extended breaks scheduled. Vacations, weddings and personal events must not conflict with classes or practicum. 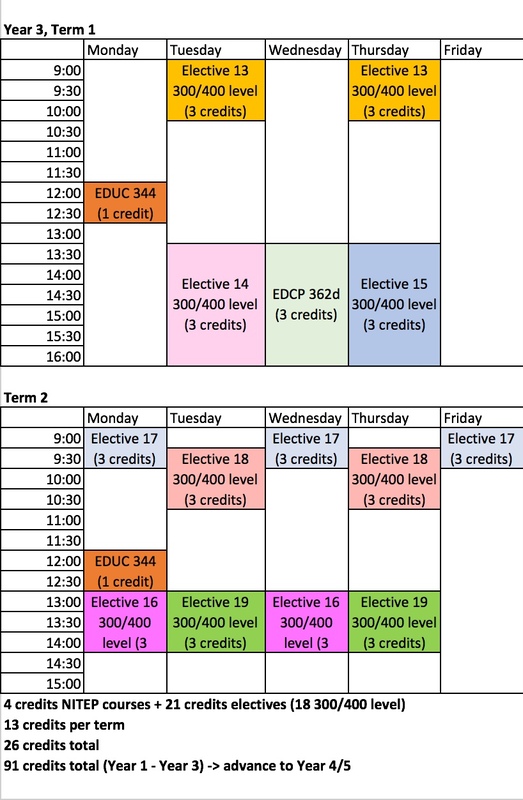 Course offerings may vary depending on each cohort standard timetable.